Business takes place in an increasingly global environment, crossing political and cultural boundaries that challenge corporate values. 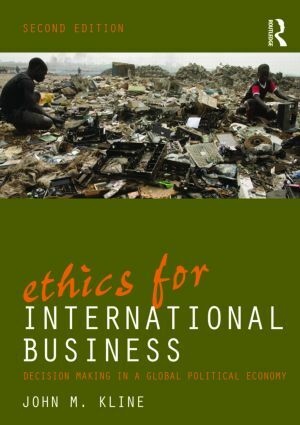 The central focus of this successful and innovative text lies in how to make and explain 'best choice' judgments when confronting ethical dilemmas in international business situations. The newly-updated version of this groundbreaking textbook continues to provide a topical and relevant analysis of the ethical dimensions of conducting business in a global political economy. From a starting point of applied ethics, the book introduces a common set of normative terms and analytical tools for examining and discussing real case scenarios. oil investments in the Sudan, Burma and Nigeria. three additional figures that help depict the ethical analysis process. The continued globalization of business increases the relevance of this textbook and its unique focus on specifically international ethical challenges faced by business, where governments and civil society groups play an active role. While most business ethics texts continue to focus heavily on ethical theory, this textbook condenses ethical theory into applied decision-making concepts, emphasizing practical applications to real world dilemmas. Anyone with an interest in the ethical implications of international business, or the business implications of corporate responsibility in the global market, will find this book a thought-provoking yet balanced analysis. Clearly written, this has become the textbook of choice in this increasingly important field.